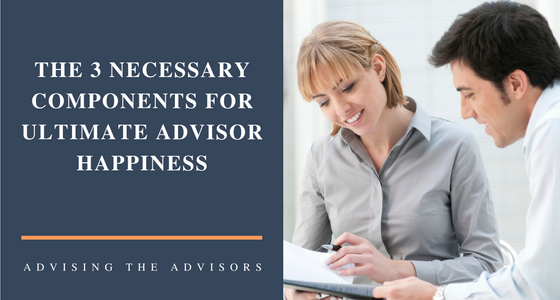 Many financial advisors with whom I have worked with, complain that although they make a very comfortable living, they would not describe themselves as truly happy. Because Seligman’s research into happiness over the past decade (across many cultures) has shown such consistent results, I encourage advisors to embrace these three components of happiness into both their home lives, and in their work routines. Maintaining these strengths will buffer you from any challenge that your career and your clients bring into your life. As a result, your overall happiness will be maintained, despite the adversity you may face daily in your career. I will extrapolate from Seligman’s proven components of happiness in life in general, and apply them to the advisor’s career, in particular. Seligman’s research-based concept of “The Pleasant Life” involves looking at the past, present, and future with positive emotion. For your career, you can also look at your past, present and future in the same light; including the powerful emotions of satisfaction, contentment, fulfillment of pride, and gratitude. One can easily embrace all of these emotions as you reflect on your career. Rather than focus on negative reactions that follow adverse events like: frustration, fear, and anxiety, you can focus on the positive. Often, you are so caught up in negative emotions regarding your career, that you forget about the pride stemming from the accomplishments you have achieved over the years. There is also immense gratitude for being able to support your family in a comfortable way, and maintain the wealth and financial security of your valued clients and their families. Positive emotions to focus on your career include: hope, optimism, faith, trust, and confidence. Optimism, in particular, has been shown to be a major buffer against depression. Action Plan: So many of us have insomnia. At bedtime, we tend to rehash stress and anxiety-filled events that took place during the day, and we anticipate stressful events happening tomorrow. Keep a notebook near your nightstand and each night before retiring, list the things and events of the day for which you are grateful. You’ll be amazed at how many wonderful things you may have taken for granted. Seligman’s second powerful component of true happiness is “The Engaged Life.” This includes involvement with— and absorption in ones’ work, close relations and leisure. The concept of “Flow” involves a psychological state that accompanies being highly engaged in your work. You can enhance your engagement by recognizing your talents and strengths. Try focusing on the opportunities that you have, to emphasize and build these talents. Action Plan: We spend so much time criticizing ourselves, while pushing our pride to the background. This is a reversible habit. Each day recognize your talents and skills, and praise yourself. Write down several (non modest) positive affirmations describing all of your wonderful accomplishments, and the best strengths you possess. In Seligman’s theory, the third pillar of happiness is the pursuit of “meaning.” This boils down to recognizing your signature strengths and talents. It focuses on how they relate to belonging to, and serving something that has real meaning. Many concentration camp victims credited their survival to the internal search for “meaning” in their lives. They believed that regardless of their present circumstances, goodness and recovering health would prevail for them. Seligman’s research shows that people can find healthy “meaning” in life when they mentally train themselves. They need to switch the perception of their circumstances from pessimistic to optimistic. So, what can you do in your career to fully engage in your search for “meaning?” You should first look at negative and unfortunate events as temporary, not repeatable. They are not your fault or related to any ineptness; they are certainly not as reflective of any pervasive weaknesses. Your career core values were formulated by your education in the financial industry, modeling mentors whom you respect for their wisdom, and the positive results you have attained by sticking with these values (despite the challenges). Action Plan: Write down how your career adds significant “meaning” to your life, in a very positive way. How does your career enhance your life? How do your skill sets and experience enhance the financial security of your valued clients? If you believe that adding more meaning to your career would be helpful, brainstorm new ways you can bring significant meaning to your clients and your career. Keep this note handy so you can re-read it anytime you begin to question whether it was worth the grind and devotion you have put into your career. Remember, having meaning in your career (and life) is one of the best ways to ward off depression. Find “meaning” in your career. Accept the gratitude for what your career has brought to you and your family (i.e., the notion of a “pleasant career”), plus the feeling of being fully “engaged” in your work. Now you are on the road to combining emotional wealth, with that of your financials.